Pack size: 2 x 60ml Boston Simplus Cleaning Solution, 2 x Contact lens case & 1 x travel bag. Review Boston Simplus Flight Pack Easy to take with me for trips! Air travel can be very troublesome for wearers of gas permeable contact lenses, with low cabin humidity and high temperatures contributing to dry eyes. 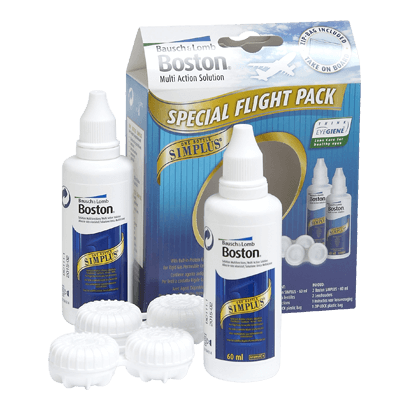 This Boston Simplus Flight Pack from the lens experts at Bausch and Lomb seeks to remedy this situation, providing everything that frequent fliers will need to prevent discomfort when in the air. • The Boston Simplus Flight Pack is fully compliant with airport regulations, ensuring that it will be available for your needs during the flight and beyond. • The flight pack includes sufficient Simplus lens cleaning solution for gas permeable lenses to last two weeks. Thus entails two 60ml bottles, as well as couple of lens cases. These are bundled with a handy zip up bag for storage. • Aside from providing reassurance and comfort on flights, this is also a space efficient way to take Simplus cleaning fluid away on holiday. • Simplus is the most effective cleaning solution for gas permeable lenses, eradicating protein and dirt deposits. The Boston Simplus Flight Pack could save fliers a great deal of discomfort. Specially designed to fit in with the requirements of airport security, this is an ideal purchase for anyone with worries about lens comfort who needs to take regular flights. Getting airborne does not have to be a chore with the Boston Simplus Flight Pack.